Just like buying from a bridal shop... buying discount wedding gowns online has some risk involved. In the bridal industry problems do come up from time to time involving sizing, color, the wrong style and delivery problems. This happens whether you order a gown from the local wedding dress shop or an online wedding dress store. But when you order online you can’t physically get in front of someone to handle the problem. You have to handle any problems by phone or email. So let's limit your chances of a problem coming up. Before you order your dream dress did you do this? Find a reputable dealer who have a good track record. Did you check review sites for feedback and check out their Better Business Bureau Record? Check the sites policies on how they handle returns and exchanges. Some give no refunds or only 50% back. 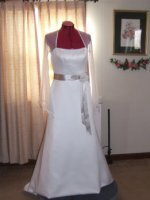 Order your gown well in advance of your wedding so that if it has to be returned for a problem, you have time to do so. Remember it takes 4 to 6 months to receive a wedding dress, depending on the designer. Order from a website that sell "authentic" designer wedding dresses and is an "approved" dealer. Always double check the style number you have by going to the designer’s website to confirm it. You don’t want to order the wrong dress. It is best to be measured by a professional seamstress for accurate measurements. You can also use them to alter your wedding gown when it comes in. "To make sure you are looking at websites selling authentic designer bridal gown... steer clear of the online websites that sell replica dresses made in China for unbelievably low prices. Some brides have mistakenly bought gowns from those sites thinking they were getting the same dress they saw in a bridal shop or pictured on the designer's website." 1.Make sure your bridal gown information is correct. Once they have this information, they will contact you with pricing and delivery information if it is not available on the website. You can go to the designer’s website to search for the gown to get a style number. What if you are looking at a bridal magazine, like Brides magazine, and have fallen in love with a gown pictured but don't know the style number? Try calling customer service and give the page number and the month of the bridal magazine that you are looking at... they may be able to come up with a style number and pricing information for you that way. 3.You have to take accurate measurements and read the size charts correctly in order to choose the right size. When ordering discount wedding gowns have accurate measurements taken. Match them up to the correct size. Your gown size rarely will be the size you normally wear in street clothing. Most of the time your size in a wedding gown is going to be typically 1 to 3 sizes bigger. So don't be alarmed. For example if you wear a size 10 in regular clothing... your dress size in a wedding gown might be a size 12 to 14. It all depends on the designer. If you order your dress way too small or way too big you will have consequences to pay later by way of expensive alterations. Depending on your size, your height and the time you order, you can encounter extra charges. Find out all fees, like extra size, extra length, rush cuts, extra rush shipping charges, etc. Some of these can be avoided by making sure you order way in advance of your wedding. Find out which is the best online website to buy a discount bridal dresses.